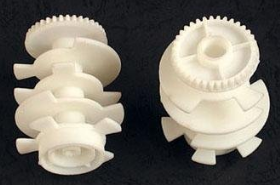 In stereolithography, the parts are made from resins. These materials are equivalent materials. There are several types with different properties. PP equivalent resin: this imitation is used for prototypes requiring a certain bending strength. ABS simulating resin: this is used for projects with no particular constraints. PC imitation: this material allows the creation of transparent prototypes. PA type resin: this type of material is recommended for parts that must have a certain rigidity. Flexible resin: parts produced with this imitation material can have varying degrees of hardness (Shore). In addition, it is possible to produce parts of different colours or even opaque parts. However, it is necessary to slightly modify the capabilities of these resins. Indeed, they allow parts to be obtained with a lower quality than traditional prototyping technologies. CNC machining: with this process, the parts are machined in a plastic block. They are therefore produced with the right material. Thus, the rendering of the prototypes is very close to the series part, which is not the case for stereolithography. Vacuum casting: vacuum duplication also uses equivalent materials. However, it provides parts with superior quality. In fact, the prototypes manufactured with vacuum duplication are functional and permit mechanical and visual testing. The resins and the manufacturing process are different. Thermoplastic injection: the prototypes obtained with this prototyping technology are identical to series parts. This process uses the right material to produce the parts. Thus, the heat distortion properties, flexural modulus or tensile strength are completely different from stereolithography. In conclusion, SLA stereolithography allows parts to be obtained that comply with a few simple constraints. On the other hand, projects requiring prototypes with mechanical and visual properties identical to series parts must be manufactured with other prototyping techniques.